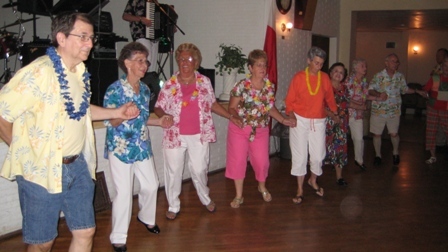 People packed the Polish Hall and joined in the fun for the clubs Hawaiian S.H.I.R.T. dance. 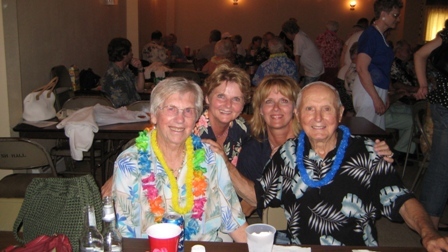 Polka Connection and Larry Hallar's Two Star Final provided the entertainment. S.H.I.R.T. is an acronym for Selling's Hard for Individual Raffle Tickets. We discontinued our raffle ticket sales for our festival and replaced it with this dance. It's certainly more fun and less work for the ticket sellers. 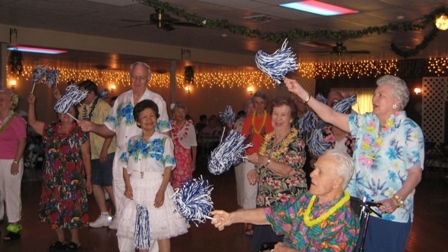 Club members welcome the bands enthusiastically with their clubs blue and white colored pom-poms. Mike Bergmire leads one of the line dances which are very popular on the dance floor. No partner necessary. 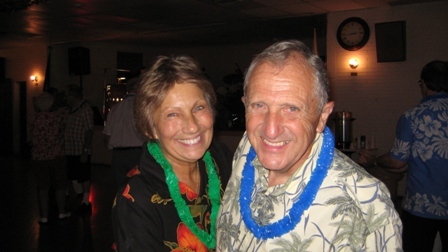 Ellie Willbrand and Jim Wrobelwski cut a rug on the dance floor. 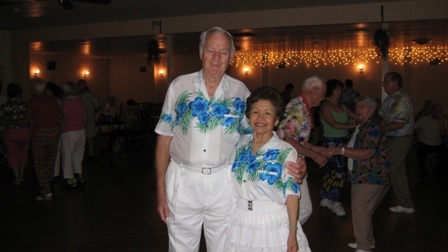 Jim has been looking forward to attending one of the club dances this year, and he made it! 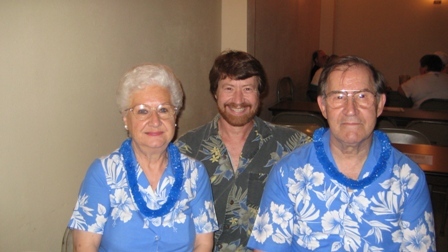 Don and Dina Clark in matching outfits. Always a hit at the club functions. 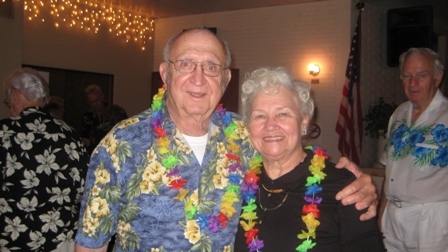 Francis and Sharon Jelinek traveled 250 miles to attend their first event at the Polish Hall since they joined the club. They were impressed with how friendly everybody was and will try to make another long trip soon to attend another event. 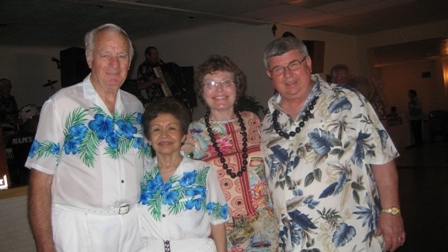 Dorothy and Stanley Myrda in their Hawaiian attire which just happen to be the same colors of the club. They pose here with with their son Tom who has attended some of the events in the past. He's a good dancer too. 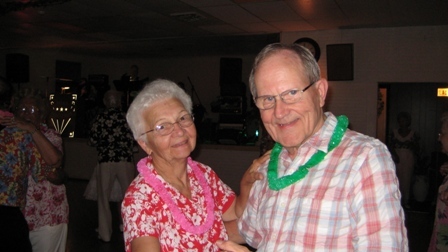 Don and Carnetta Vonde Haar take time out of their dancing to give the photographer a little smile. 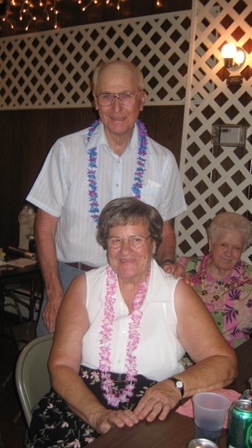 Eleanor and Harold Sumowski from Troy MO. 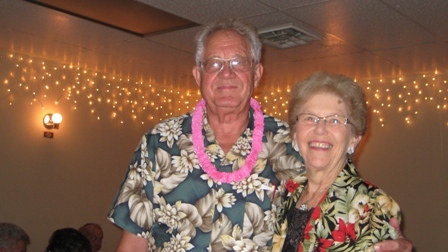 Eleanor and Harold are club officers; Eleanor is the social director, and Harold is a master at creating and publishing the club's quarterly newsletter (with Eleanor's help!). 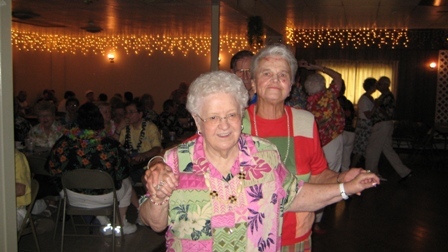 Clara Popovchak and Laverne Kiekle dance the schottische. 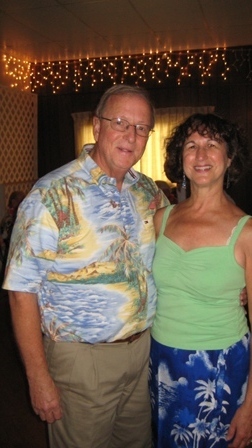 Kathy and Sid Barone find a moment in their busy schedule to attend the Hawaiian S.H.I.R.T. dance. They really tear up the dance floor. Vera Renth, Marietta and Maurice Mareschal, and Jerry Renth gather for a quick snapshot. 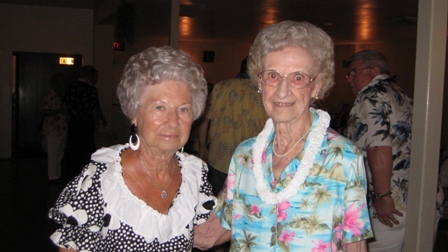 Louise Kreitner and Ann Muich just after a dance. 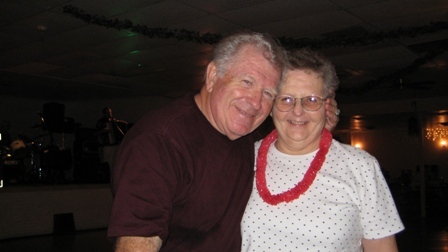 Ann has recently recovered from a broken hip and we're happy to see her out on the dance floor doing what she likes to do best - polka dancing. 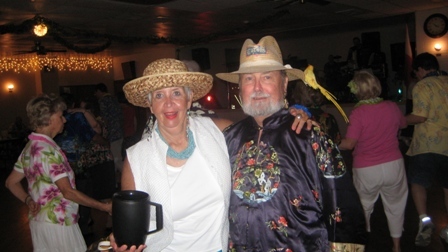 Michael and Barbara Bergmire, in their festive outfits. 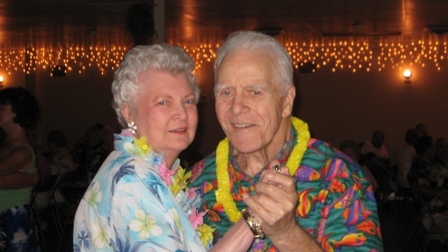 They're always ready to dance - polkas, waltzes, and they're particularly fond of the shag. Wanda and Jack Titterington. They never fail to make a fashion statement. 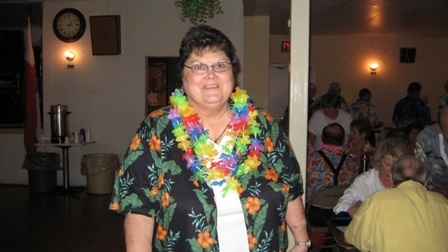 Pat Bednara in her floral attire. 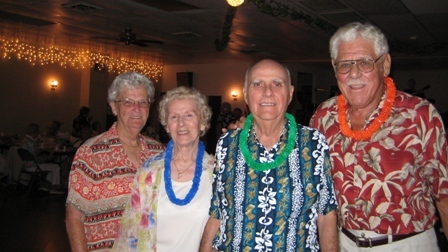 Vera and Sonny Walker, Joanne and Jack Fedak and Ron Andracsek pose in front of the band stand in their Hawaiian shirts of many colors. Bob Galik and Theresa Jordan caught the last few hours of the event. The Clark's and the Andracsek's. Don Harper and Jeanne Lane both belong to the Folkfire organization and dropped by for a few dances before they headed to another event. Double dipper dancers they are. 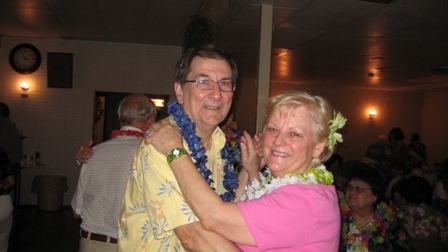 Leonard & Adele Prouhet try not to ever miss a dance at the Polish Hall. They are great supporters of the club. 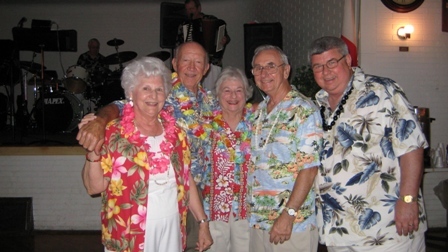 The Springfield Polka Lovers Klub is represented by Dora Jean Eck, Sharon Coleman, Mary Rhodes and Ferd Hadowsky. 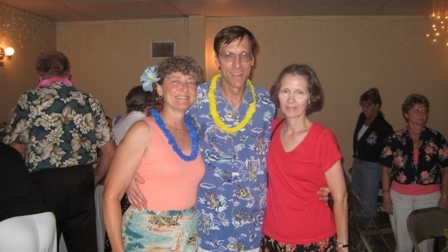 Donna Eckberg, John and Liz Lengyl are all extraordinary dancers. They enjoy dancing of all types.